A Blue Jeans Network conference connecting a traditional Polycom videoconferencing endpoint, an Apple IPhone running Skype, A MacBook Running GoogleTalk, a Windows PC running Skype, an Apple IPad running Skype, and an Android tablet running Mirial ClearSea. Blue Jeans' Chief Commercial Officer Stu Aaron and Imran Moin, Business Development Manager look on. I had the opportunity to spend some time with startup telepresence and videoconferencing cloud video services provider Blue Jeans Network at their corporate headquarters in Santa Clara, CA. The company is simplifying video managed services by providing a multi-party bridging service that is device and vendor agnostic and as simple to use as dialing into an audio conferencing bridge today. That business model and market is huge because the world is using around 80 billion audio conferencing minutes vs. a paltry 200 million minutes of multi-point hosted video. While the world has around 2 million telepresence and videoconferencing endpoints, consumer and prosumer services like Skype and GoogleTalk have north of 500 million users and growing. Converting just 5% of audio conferencing minutes to video at $0.25 per minute would be One Billion Dollars a Year! According to Chief Commercial Officer Stu Aaron, the company's customer base has grown to 5,000+ subscribers from over 1000 companies who are paying per minute charges to utilize the companies multi-party, multi-vendor, multi-device bridging service. The service is easy-to-use. Customers register for an account, schedule the date and time for a multi-point conference or launch an ad-hoc conference and the system issues an invitation with an embedded link. Skype, Google Talk, or other consumer / prosumer video clients are automatically brought into the meeting. Traditional telepresence and videoconferencing endpoints connect to a consistent Blue Jeans IP address (199.48.152.152) where they are prompted to enter a passcode that is generated with their conference reservation or during the launch of an ad-hoc meeting. All parties are brought into a video session that is hosted not on traditional videoconferencing video network infrastructure but on a cloud based service that is running on standard server infrastructure in geographically distributed datacenters around the world. 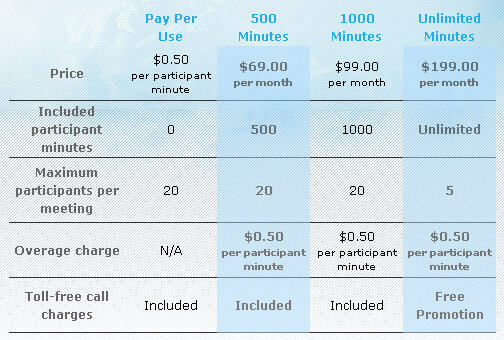 The Blue Jeans Network service is priced similarly to audio conferencing where participants pay for various blocks of minutes and per minute charges for overages. 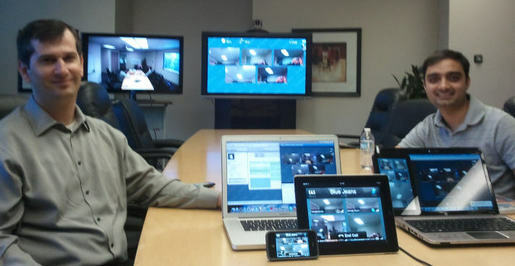 I have used the service to connect a Polycom HDX videoconferencing endpoint with a LifeSize HD endpoint and I have witnessed multiple demonstrations connecting the impressive variety of codecs and devices listed in the caption of the picture above. The maximum number of participants on each call is 20 high definition participants connecting through the standard service which can also easily include audio participants. The company can support meetings of 35-40 with advance notice and promise hundreds of participants by the end of the year. The system also handles data collaboration among disparate endpoints including sharing full motion video from a video source or YouTube and web-based services such as Google Docs. Imran Moin, the company's Chief Demo Officer, boasts the company's reliability is over 99% and the service is capable of multiple continuous presence layouts including voice activated switching where the current speaker is automatically promoted to the largest window on the screen. Each participant can control their own layout and the moderator can mute and/or disconnect individual participants. 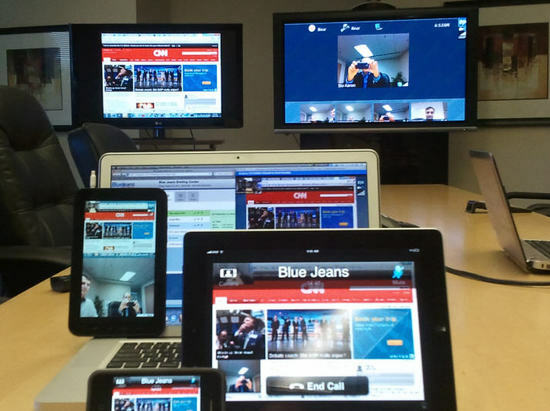 Blue Jeans offers data collaboration across multiple multi-vendor platforms including the ability to share full motion video content including YouTube videos. The company's server arrays are connected to multiple tier-one internet providers where traffic is optimized using BGP to route packets onto the destination network as quickly as possible. Each video endpoint is connected and shared at the highest quality possible and while network connections might scale down the quality of one particular participant the entire meeting is not degraded. The service offers full support for H.235 encryption and Skype's 256 bit encryption as well. The moderator has the ability to specify that only encrypted endpoints can participate in a meeting. The service has limitations: Cisco TelePresence endpoints, Teliris SVC and Vidyo endpoints aren't able to connect natively at high definition and must be transcoded or connected through their respective gateways to connect at H.323. The system doesn't yet address multi-screen, multi-codec endpoints connecting and leveraging those systems spatial acoustics and/or optimizing eye-lines for telepresence multipoint where multiple locations are visible as a global roundtable. While the service is optimized for the best-effort internet as described above, there is currently no exchange capability to connect video endpoints on enterprise and/or carrier MPLS networks. Blue Jeans is a startup incorporated in 2009 that has raised $23.5MM from Accel Partners, New Enterprise Associates, and Norwest Venture Partners. 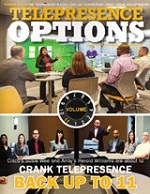 The company has a tier-one management team staffed, uniquely, with veterans of server virtualization vs. traditional videoconferencing industry veterans. CEO Krish Ramakrishnan was previously general manager for Cisco System's server virtualization business and CEO of Topspin Communications, which developed server virtualization solutions for grid and utility computing applications and was acquired by Cisco in 2005. Co-founder and CTO Alagu Periyannan was CTO at Blue Coat Systems which developed hardware proxy appliances. Chief Commercial Officer Stu Aaron, who introduced CEO Ramakrishnan to CTO Periyannan in 2008, was a vice president at clean tech provider Bloom Energy and held various executive roles at Topspin and CacheFlow. The company also boasts an impressive board of advisors with videoconferencing veterans including Bob Hagerty the former CEO and Chairman of Polycom, Jonathan Heiliger, Vice President of Technical Operations at Facebook, and Killko Caballero, former CEO of FVC, CUseeMe, head of strategic alliances at Codian, and current Senior Director of UC Products and Strategy at Avaya. The Board of Directors includes: Charlie Giancarlo, a former Cisco chief and currently a partner at Silverlake, Matthew Howard - Norwest Venture Partners, Ping Li - Accel Partners, Scott Sandell - New Enterprise Associates, and Peter Wagner, Accel Partners. The company currently numbers less than 100 employees but is growing rapidly and has outgrown their current headquarters in Santa Clara. The company has already announced a strategic partnership with Deutsche Telekom and its first VAR deal with video managed service provider IVCi. Howard Lichtman is the President of the Human Productivity Lab, an independent consultancy focused on telepresence and effective visual collaboration for organizations looking to improve productivity and reduce costs. The Lab provides corporate clients with acquisition consulting, RFI/RFP creation, and ROI/TCO financial modeling on telepresence systems, telepresence managed services, and inter-networking telepresence. 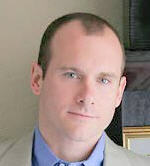 The Lab also provides investors with prescient insight into the rapidly growing telepresence industry. 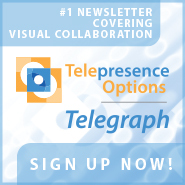 Mr. Lichtman is also the publisher of Telepresence Options, the #1 website on the internet covering telepresence technologies and the editor of Telepresence Options Magazine and the Telepresence Options Telegraph. I had the opportunity to spend some time with startup telepresence and videoconferencing cloud video services provider Blue Jeans Network at their corporate headquarters in Santa Clara, CA. The company is simplifying video managed services by providing a multi-party bridging service that is device and vendor agnostic and as simple to use as dialing into an audio conferencing bridge today. That business model and market is huge because the world is using around 80 billion audio conferencing minutes vs. a paltry 200 million minutes of multi-point hosted video. While the world has around 2 million telepresence and videoconferencing endpoints, consumer and prosumer services like Skype and GoogleTalk have north of 500 million users and growing. Converting just 5% of audio conferencing minutes to video at \$0.25 per minute would be One Billion Dollars a Year! Blue Jeans is a startup incorporated in 2009 that has raised \$23.5MM from Accel Partners, New Enterprise Associates, and Norwest Venture Partners. The company has a tier-one management team staffed, uniquely, with \nveterans of server virtualization vs. traditional videoconferencing \nindustry veterans. CEO Krish Ramakrishnan was previously general \nmanager for Cisco System's server virtualization business and CEO of \nTopspin Communications, which developed server virtualization solutions \nfor grid and utility computing applications and was acquired by Cisco in\n 2005. Co-founder and CTO Alagu Periyannan was CTO at Blue Coat Systems \nwhich developed hardware proxy appliances. Chief Commercial Officer Stu \nAaron, who introduced CEO Ramakrishnan to CTO Periyannan in 2008, was a \nvice president at clean tech provider Bloom Energy and held various \nexecutive roles at Topspin and CacheFlow.